Home » Mindfulness » Mindfulness and the Brain: What Does Research and Neuroscience Say? We have all heard the term “mindfulness” but what does it really mean in terms of the brain and in terms of neuroscience? Being present in the moment is very empowering. It means focusing your awareness on the here and now. It’s about embracing each moment of the day and not worrying about what tomorrow may bring. Living in the present moment can be transformative, but what does it do to the brain? The human brain contains hundreds of trillions of synapses that help the brain cells communicate with each other. The brain contains anywhere from 80 to 100 billion neurons, which help form these connections. Despite all of this, scientists still don’t have a full understanding of what actually happens in the brain when we practice mindfulness or meditate. Our knowledge of the brain is really the tip of the iceberg because there is still so much more we need to learn. In this article, we will take a look at the field of mindfulness research, examine certain studies, and look at how mindfulness affects and changes the brain. Researchers are even looking into how mindfulness can help with things like ADHD and autism, which is very exciting. Mindfulness Versus Medication: What Can We Prove? There are many studies, which have been done on mindfulness. Some of the most widely recognized include Mindfulness-Based Stress Reduction (MBSR) and Mindfulness-Based Cognitive Therapy (MBCT). Jon Kabat-Zinn and his colleagues at the University of Massachusetts Medical Center developed the Mindfulness-Based Stress Reduction program. The Mindfulness-Based Cognitive Therapy program was developed by Segal, Williams and, Teasdale. Mindfulness-based stress reduction (MBSR) is a mindfulness-based program designed to assist people with pain and a range of conditions and life issues. These issues may also be issues that are difficult to treat in a hospital setting. The MBSR course has been proven to help alleviate stress, anxiety, depression and chronic pain. It combines meditation techniques with cognitive behavioral skills and mindful movement and is taught in a way that is practical and relevant for everyday living. The MBSR course is a wonderful example of how being mindful can help with many things beyond merely relaxing the mind and body and being present in the moment. The goal of mindfulness-based cognitive therapy (MBCT) is to help people change thoughts that are unproductive. This might include patterns of thought that aren’t serving you well, or other types of behaviors and emotional responses. MBCT uses psychological techniques that help patients better understand the correlation between various modes of the mind and mood disorders. When you recognize the connection, you can then work toward an appropriate answer. You can use the strong connection between the mind and pain to change the way that you think. The therapy is also thought to be helpful in the recovery from the stress and depression associated with pain. MBCT draws on the structure of MBSR integrating some approaches from Cognitive Behavioral Therapy and it is typically taught in an eight-week format for up to twelve participants. The cultivation of awareness through a mindfulness practice. A framework characterized by non-striving, acceptance, and a genuine interest in experience, which is incorporated into the teaching process. A process of linking the learning to an understanding of working with the idea of vulnerability. Personal experiential learning is integrated into a wider framework of understanding. This understanding relates both to the nature of general human vulnerability and suffering and to the particular nature of vulnerability and to depressive relapse. Typically the MBCT sessions are facilitated through dialogue, reflection, group exercises and teaching. Although the term mindfulness-based cognitive therapy may be somewhat imposing, its meaning is very straightforward. M stands for Mindfulness, or bringing your awareness to the present moment without judgment or expectation. B stands for Based, as in derived from or connected to. C stands for Cognitive, which refers to the thinking, planning, and measuring parts of the brain. T stands for Therapy or the treatment of illnesses and disease. Cognitive behavioral therapy or CBT is one of the most highly recommended and well-respected talk therapies of the 21st century. CBT is defined as an active, directive, time-limited, structured approach that is used to treat a variety of mental problems like anxiety, phobias, depression, stress, and even pain. It is a client-driven therapy where you choose your own goals. CBT focuses on the here and now much like MBCT. In the academic community, there are also many good mindfulness researchers to be aware of including Judson Brewer, MD, Ph.D., David Creswell, Ph.D., Larissa Duncan, Ph.D. and Elissa Epel, Ph.D.
Judson Brewer is a psychiatrist and an associate professor at the Departments of Medicine and Psychiatry as well as a research director at the Center for Mindfulness, UMASS Medical School. Brewer is known for his work with mindfulness and addictions. In his work with neuroimaging technologies, he is developing mindfulness techniques that help people stop smoking, overcome food cravings as well as examining how mindfulness affects the brain. Brewer is also looking into the future and researching the effects of mindfulness delivered digitally. According to Brewer, this is the future of mindfulness and it’s important to study it. Brewer’s team is also developing an app, “Unwinding Anxiety,” which they plan to study in future clinical trials. David Creswell, an associate professor of psychology, is researching stress and resiliency. His work is examining what really makes people resilient when they come upon stressful situations in life. His work combines health psychology and neuroscience. Creswell has also begun clinical trials examining how Mindfulness-Based Stress Reduction may help improve social relationships as well as promote healthy aging for older adults. Larissa Duncan is currently the Elizabeth C. Davies Chair in Child & Family Well-Being. She is also an associate professor of human development and family studies at the School of Human Ecology and the Center for Healthy Minds at the University of Wisconsin–Madison. Duncan is currently working on finding ways to explore mindful parenting and helping to bring mindfulness training to pregnant women, as well as children, adolescents, and family members. Duncan is looking toward the future and studying how Mindfulness-Based Childbirth and Parenting might affect a mothers’ mental health, stress physiology, and well-being. As part of this research, she is also examining infants’ behavioral and neurological development. Elissa Epel is a Professor at the Department of Psychiatry at the University of California, San Francisco School of Medicine. Epel is known for her work which links severe stress with shortened telomeres, which are cellular structures that play a key role in both disease and aging. Epel’s mindfulness research has also focused on examining the benefits of meditation as a tool for people who are under severe stress or experiencing ongoing stress. Epel’s work is focused on helping those who have no previous meditation experience. For the future, Epel is looking at how a practice like meditation might affect people who have suffered adversity in childhood. According to Epel, these types of individuals tend to have certain patterns of thought that are ideal targets for meditation training. Mindfulness changes the brain, according to one study. Lutz, Dunne & Davidson (2008) examined how mindfulness impacts the amygdala, which is a region of the brain that is primarily associated with emotional processes. In the study, it was determined that this area of the brain tended to be less active and have less gray matter density following mindfulness sessions. The hippocampus also plays a role in mindfulness. The hippocampus, the region of the brain associated with memory, helps regulate the amygdala. Following mindfulness training, this part of the brain was also found to be more active according to Goldin & Gross (2010). Mindfulness can help us nurture healthier relationships as well, according to a study done at the University of North Carolina at Chapel Hill (Carson, J. et al. (2004). The study demonstrated a correlation between the practice of mindfulness and improved relationships. The couples in the study reported more closeness and more relationship satisfaction amongst other things. Other studies examined the prefrontal cortex, the part of the brain associated with both impulse control and maturity. This part of the brain tended to become more active following mindfulness training. (Chiesa & Serretti, 2010). In a study published in NeuroReport in 2005, results showed thicker cortical regions related to attention and sensory processing in long-term meditation practitioners, when compared with those who did not meditate. Results of research indicate that mindfulness can help you in more ways than you think, especially in the workplace. Christopher Liddy, an organizational behavior doctoral candidate at Case Western Reserve’s Weatherhead School of Management conducted research with Darren Good, an assistant professor at Pepperdine University. The research examined over 4,000 scientific papers on varying degrees of mindfulness. The researchers looked at the impact of mindfulness in terms of how people think, feel and perform at work as well as how they relate. The results of the study, Contemplating Mindfulness at Work, were then published in the Journal of Management. Mindfulness positively impacts human functioning. Mindfulness can help improve the quality of attention. Mindfulness, even though it is an internal quality, can impact interpersonal behavior. Mindfulness can help provide greater empathy and compassion. In the research it was discovered that mindfulness cannot only positively impact attention, it can also help improve cognition, emotions, physiology and even behavior. The researchers also found that mindfulness can help keep attention stable and help one remain focused on the present. Those who completed mindfulness training were better able to remain vigilant and focused, especially on visual and listening tasks. Mindfulness has also been shown to help improve 3 unique qualities of attention, stability, control, and efficacy. In terms of relationships, mindfulness can also give us a boost, helping to provide us with greater empathy and compassion. According to Sara Davin, PsyD, MPH, mindfulness is not only a powerful tool for patients but also for doctors and medical care providers. According to the Cleveland Clinic, there is ample evidence in support of the many benefits of mindfulness. Positive impact on the brain and immune system. Help with caregiver burnout healthcare providers may face. In a review of more than 20 randomized controlled trials in 2011, it was shown that mindfulness can help improve overall mental health. Mindfulness can also help reduce the risk of relapse from depression, while also helping with anxiety disorders like PTSD. Mindfulness not only helps boost the immune system, but it can also help improve our neural processing in as little as a 10 to 15-minute session. Mindfulness can also help with chronic pain. With chronic pain being an epidemic, it’s important to find alternative tools that are drug-free. Mindfulness is one of those tools. In the study, those who meditated showed a decrease in pain and pain-related limitations. The benefits were comparable with cognitive behavioral therapy. Insomnia and poor sleeping patterns can also lead to many other health problems. In randomized controlled trials, it was shown that mindfulness could help reduce insomnia, according to the Insomnia Severity Index. Mindfulness can also be very beneficial to healthcare providers as well. Burnout is a big problem in the healthcare industry, and trials indicate that mindfulness can help boost resilience and create positive changes while reducing stress, anxiety, and burnout amongst healthcare workers. We have seen that mindfulness can be very beneficial. It not only helps us cope better it also helps our brain function better. Neuroplasticity allows the brain to reorganize itself. It does this by forming new neural connections throughout our life. Evidence shows us that mindfulness can help increase our resilience, which allows us to cope better and roll with the punches. By applying neuroplasticity, you can essentially “re-wire” and “hardwire” the brain helping you achieve greater levels of peace, health, happiness, and joy. 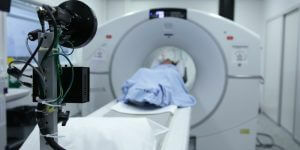 Sara Lazar, a neuroscientist at Harvard Medical School, actually uses MRI technology to look at the brain. In her research, she looks at the detailed structures of the brain to see what might be going on during certain tasks like meditation or yoga. Lazar herself used to be a skeptic until she attended some yoga classes. After attending a few classes, she literally felt the difference. She felt calmer, happier, and much more compassionate. As a result of this experience, she decided to refocus her research on the particular changes that occur in the brain’s physical structure as a result of meditation practice. In Lazar’s first study she looked at individuals with extensive meditation experience. The study involved focused attention on those internal experiences. The data showed that meditation might serve to slow down or even prevent age-related thinning of the frontal cortex. This area of the brain otherwise contributes to the formation of memories. We assume that we become forgetful as we age. However, Lazar and her team discovered that those who meditated in their 40’s and 50’s had the same amount of grey matter as those in their 20’s and 30’s. In Lazar’s second study, she used people who had never meditated before. These people attended a Mindfulness-based stress reduction training program, where they took a weekly class. They also participated in various mindfulness exercises, including sitting meditation, mindful yoga and a body scan practice. Sessions lasted for 30 -40 minutes every day. In this study, Lazar tested the recipients for the positive effects that mindfulness meditation would have on psychological well-being. Lazar was also interested in helping people alleviate symptoms of chronic pain, insomnia, depression, and anxiety, amongst other things. Areas of the brain that decreased from the study included the amygdala. The hippocampus is a structure of the brain shaped like a seahorse. It is responsible for the regulation of emotions, spatial orientation, learning and the storage of memories. The temporoparietal junction is the area of the brain where the parietal lobes meet the temporal area. This area of the brain is responsible for empathy and compassion. The study results also showed that the amygdala decreased, which meant the fight-or-flight response, the reaction to threats, also decreased. 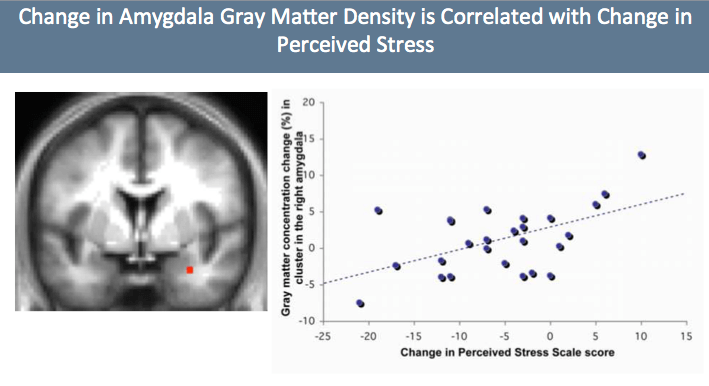 The smaller the amygdala becomes, the better people react to stress. The decrease in the brain’s grey matter correlates with the changes in the levels of stress as well, according to the study. All of this research is promising because it means that the change in people’s reactions occurs within themselves, and not in the environment itself. In the end, mindfulness can help you change how you react to stressful situations, helping you feel calmer and much more in control. Over the past 10 years, studies in neuroimaging have investigated certain changes in brain morphology as it pertains to mindfulness meditation. One meta-analysis taken from 21 neuroimaging studies examined the brains of 300 experienced practitioners of meditation. The study revealed that 8 unique regions of the brain were consistently changed in those who were experienced in meditation. In looking at this research, we can certainly see a positive trend, with those who meditate and practice mindfulness. What do all of these unique regions of the brain really do? The rostrolateral prefrontal cortex is a region of the brain that is linked with a greater awareness of the thinking process (meta-awareness), the processing of complex, abstract information and introspection. The sensory cortices and insular cortex are the parts of the brain that are the main cortical hubs when it comes to tactile information, like touch, pain, body awareness, and conscious proprioception. The hippocampus is a pair of subcortical structures that are involved with the formation of memory as well as facilitating emotional responses. The anterior cingulate cortex and mid-cingulate cortex are those areas in the brain connected with self-control, the regulation of emotions, as well as attention. The superior longitudinal fasciculus and corpus callosum are what is called white matter tracts. These areas communicate between and within the hemispheres of the brain. Researchers suggest that the effect of meditation on these brain structures appears to be medium in magnitude. This outcome is comparable to the effects of other interventions such as psychological interventions, education, and behavioral interventions. Because this study involved so many different regions of the brain, researchers suggest that the effects of meditation might involve multiple aspects of brain functioning on a large scale, which is very promising. As a result of this work, Tang, Holzel, and Posner suggest that engaging in mindfulness practice is indeed promising in terms of the treatment of clinical disorders, helping to encourage a healthy mind and enhanced well-being. Research with mindfulness and meditation is really still in its infancy. Even with that, a number of studies have investigated changes in brain activation both at rest and during very specific tasks that are associated with the practice of mindfulness meditation. There have been some promising studies when it comes to comparing mindfulness therapies to medication. In one recent trial, Mindfulness-based cognitive therapy (MBCT) was compared with anti-depressant medication. The results of the study showed that with participants who had an unstable remission that 73% of them had a reduction in the risk of relapse in both the MBCT and the antidepressant group compared with a placebo. There were no differences between the MBCT group and the depressant group. These results are encouraging because it suggests that MBCT is a reasonable alternative therapy to standard medication. Those who used MBCT worked to develop capacities and coping strategies so they could then view their thoughts differently, seeing them in a bigger, wider way. As a result, they developed more self-compassion, which helps to mediate the efficacy of MBCT. Mathew Brensilver, Ph.D., also has an opinion on the effectiveness of mindfulness versus psychiatric medication like antidepressants. According to Brensilver’s research, antidepressant use has expanded significantly over the years. In 2000, only 6.5% of the population used antidepressants. Compare that to 2010, and you’ll see that the number has increased to 10.4%. Both medication and meditation and mindfulness have similar goals – to reduce the amount of distress. There are different schools of thought when comparing these two interventions. For some, going on antidepressants allows them to feel much more stabilized, which then allows them to focus better on a practice like mindfulness. It has also been shown that combining medication and psychotherapy often results in better outcomes than one of those alone. The same thing might be said for combining mindfulness and meditation with antidepressants, resulting in a better outcome. According to Brensilver, psychiatric medication is not generally designed to help someone thrive and flourish. Mindfulness, in his opinion, cannot only help alleviate distress, but it can also lead one into a state of mind where they are flourishing, which can help them develop deep completeness of the moment. There has been some research done with something called Mindful Parenting that proves to be hopeful. Mindful parenting involves applying the skills of mindfulness into the child-parent interaction. This includes listening with full attention, having a non-judgmental acceptance of the self and the child as well as self-regulation in the parenting relationship. One reason mindfulness may be effective for those with autism has to do with the part of the brain known as the amygdala. A “hot” system, which is largely automatic involving sensory and emotional processing (the amygdala). And a “cold” system that involves cognitive processing (the prefrontal cortex and anterior cingulate cortex). During acute or chronic stress, the hot system tends to be overly responsive when compared to the cold system. To lower levels of stress, it’s important to find a balance between these systems. This can be done by increasing cognitive control and regulation and lowering sensory and emotional processing. Mindfulness meditation appears to help some people strike that precious balance. Focusing on and observing what one is sensing and feeling, in terms of the hot system, allows them to respond in a much calmer manner. According to Singh et al. (2011), mindfulness may also be helpful for those with Asperger syndrome. Those with Asperger syndrome, which is on the autism spectrum, tend to exhibit aggressive behavior on occasion. In one study, with a multiple baseline design across subjects, three adolescents with Asperger syndrome utilized a mindfulness-based process known as Meditation on the Soles of the Feet. This meditation practice helped control their physical aggression in the home and in the community. Subjects were taught to shift the focus of their attention away from negative things that may have previously triggered aggressive behavior to something neutral, like the soles of their feet. Prior to the mindfulness instruction, the adolescents displayed moderate rates of aggression. During the mindfulness practice, the mean rate of aggression on a weekly basis decreased. The study lasted between 17-24 weeks. The aggression levels decreased from 2.7, 2.5 and 3.2 to 0.9, 1.1, and 0.9, respectively. No aggressive instances were observed during the last 3 weeks of the mindfulness practice. No episodes of physical aggression occurred during a 4-year follow up, which is even more promising. This study suggests that those young adults with Asperger syndrome may be able to successfully use a mindfulness-based procedure to help control their aggressive tendencies. According to a National Institute of Health study, meditation or medication, mindfulness might also be useful in the treatment of ADHD. In one randomized controlled trial researchers compared the affectedness of mindfulness instruction to the effectiveness of methylphenidate amongst children with ADHD. The study is currently focused on measures of attention and hyperactivity as well as impulsivity. While medication is typically the first sought after treatment for ADHD, its effects are often short-term. Medication also has side effects and the adherence is often low. Training in mindfulness is emerging as a good choice for young people with ADHD. The outcomes of the study will be presented at conferences and in scientific and peer-reviewed journals. The results will help not only families of those with ADHD but also general practitioners and mental health providers. This study will also help inform health insurance companies as to which treatment is more cost-effective in the long term. Data collection for this study is ongoing, but it offers hope to those who are seeking alternative treatments for ADHD. The brain is made up of billions of neurons. These neurons need to communicate with one another and with other parts of the body. All of these systems work together in a cohesive fashion. The brain is plastic, meaning it has plasticity, the ability to learn and grow and change over time. Meditation affects the brain’s functionality, its structure, and its thought patterns. The more you meditate and practice mindfulness, the more the brain’s synapses strengthen, which can help improve your life. Every time you indulge in those negative thoughts and feelings, you are strengthening their effect on you. However, every time you engage in positive thoughts and behaviors and let go of the negative ones, you are retraining your brain to think a little differently. We think what we repeatedly think as well. Thanks to the study of neuroscience, the scientific community has become much more aware of how the brain works. Joining together neuroscience and mindfulness, you can begin to bridge the gap and connect all of the dots between how the brain really works and how those daily practices can impact your life. By practicing mindfulness and meditation, you can then begin to more fully understand how your emotions, thoughts, and feelings impact your life. If you want to to take one small step in support of a happier, healthier, and calmer way of life, mindfulness and meditation is a great place to start. Beddoe, A & Murphy, S. 2004. Does Mindfulness Decrease Stress and Foster Empathy Amoings Nursing Student? Journal of Nursing Education, 43(7), 305-312. Carson, J. et al. (2004). Mindfulness-Based Relationship Enhancement. Behavior Therapy, 35, 471-494. Crane, R.S., Brewer, J. A., Feldman, C., Kabat-Zinn, J., Santorelli, S., Williams, J. M. G., Kuyken, W., (2017) "What Defines Mindfulness-Based Programs? The Warp and the Weft.” Psychol Medicine 47: 990-999. Lazar, S. et al. (20 NeuroReport, 16(17), 1893-1897.05). Meditation experience is associated with increased cortical thickness.